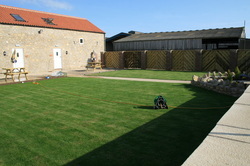 For many years used to store the grain harvested on the farm, now see the transformation to the new luxury cottages. The Grainery is a 2 bedroomed 2 floor cottage.The lounge has 2 large picturesque windows two settees and display cabinets with 32" flat screen tv and DVD player bookcase and a few books, dvds and games. full oil fired central heating.The open staircase leads from the lounge to the upper floor. The kitchen/Dining Room is equipped with fridge, dishwasher, washer/dryer, eye level oven and hob, microwave, kettle and toaster. The modern bathroom on the upper floor consists of a bath,toilet, sink and separate shower cubicle. Two large velux roof windows with blackout blinds. The second bedroom has 2 single beds wardrobe, drawers and dressing table, bedside cabinets with lamps.